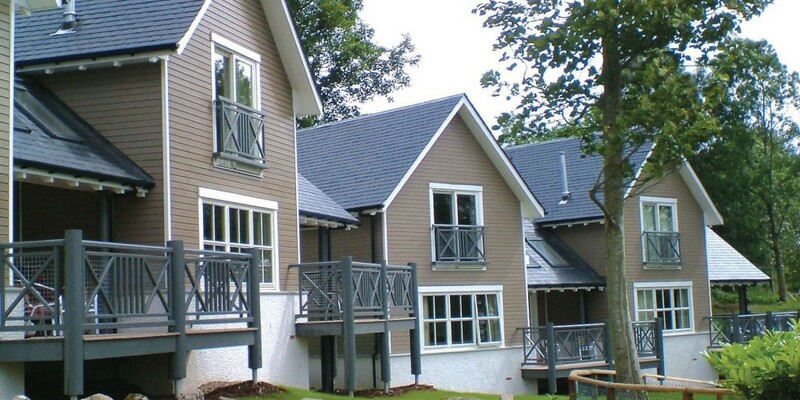 Ten new self-catering chalets have been constructed in the grounds of the Crieff Hydro Hotel in Scotland, and coated using Sadolin Superdec woodstain, they provide a stunningly eye-catching addition to the hotel. The timber frame, timber clad two-storey structures were designed by Comrie architects, James Denholm Partnership and combine luxury accommodation with innovative design through colour and materials. Some of the chalets are clad with weatherboarding and all are on a white rendered base course. The project follows on from the success of a similar scheme to erect 13 chalets in the hotel grounds to provide extra accommodation for guests.